Members of the Guardians of the Children and the Canadian Independent Riders club came together to host a fundraising ride and barbecue to raise funds for the Arthur family on Saturday. Photo by Adam Prudhomme. 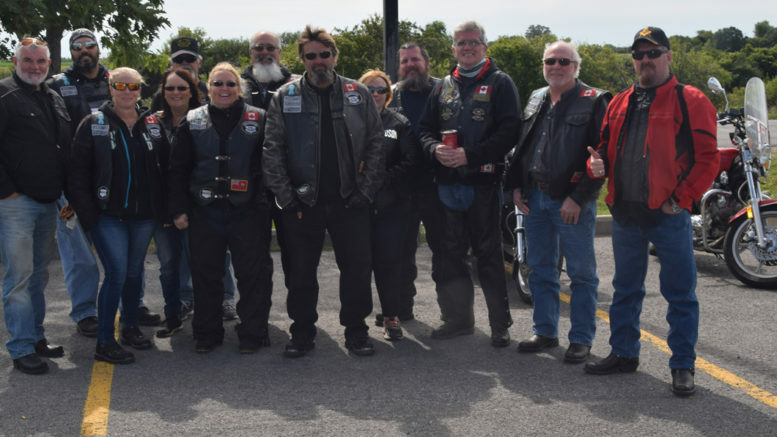 A pack of motorcyclists did its part for the #CamdenStrong cause on Saturday, hosting a fundraising ride through Greater Napanee and barbecue in the parking lot of the Strathcona Paper Centre. All proceeds from the event will go toward Camden Arthur, a local boy who is battling cancer. Vance said he was moved to help as Arthur’s father was a coach for his son’s minor hockey team. “We’re just trying to help out because he’s put so much back into the community,” said Vance. The event started with a group of about 15 motorcyclists leaving the SPC, travelling along Centre Street, around to the Loyalist Parkway, through Camden East and back to SPC. Once they returned, they hosted a charity barbecue while kids waved signs at the side of the road to attract passersby. All the materials for the barbecue were donated, allowing all proceeds to go to the Arthur family. “Bikers and truck drivers have got big pockets when it comes to helping someone in need,” added Vance. Anyone interested in supporting the cause can search #CamdenStrong on Facebook to find out how to get involved.